Régie intermunicipale de l’énergie du Bas-Saint-Laurent (RIÉBSL), the Régie Intermunicipale de l'Energie Gaspésie-Îles-de-la-Madeleine (RIÉGÎM) and EDF Renewables, together with around 170 guests, celebrated the inauguration of the Nicolas-Riou Wind Project today. The Project, with a capacity of 224.25 megawatts (MW), illustrates the importance of collaboration and support of local communities in the development and implementation of renewable energy projects. Present at the inauguration, Mr. Jean D'Amour, Minister Delegate for Maritime Affairs, Minister responsible for the Bas-Saint-Laurent region and Member for Rivière-du-Loup - Témiscouata, took the opportunity to highlight the contribution of the workers and various stakeholders in the project. 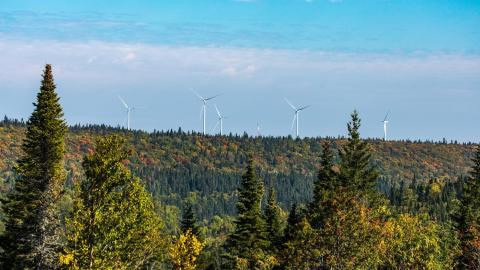 "I am very happy with the completion of this wind farm in Lower Laurentian territory. This project is certainly a major environmental project, but also represents a significant contribution to the economic development of municipalities and RCMs in the Bas-Saint-Laurent region." "Pride is the word that sums up the last nine years of commitment to build Canada's largest community wind farm. This is a very nice private-public achievement resulting from the pooling of the skills of both partners," said Michel Lagacé, President of RIÉBSL. "It is estimated that 50% of the hours worked resulted from Bas-St-Lauren contractors, half of whom are based in one of the two RCMs that host the Project. During the 18 months of construction, the Nicolas-Riou wind farm generated direct benefits of approximately $31 million in wages and purchases of services and materials in the Bas-Saint-Laurent region, of which more than half was in the RCMs of Basques and Rimouski-Neigette." According to Simon Deschênes, President of RIÉGÎM, "In addition to the profits distributed to public shareholders (forecast of $8 million annually over the next 25 years), annual contributions of $1.1 million will also be paid to the two RCMs during the life of the project. These are considerable sums that can be used at the discretion of communities, particularly as levers for development projects." The Régie Intermunicipale de l'Energie Gaspésie-Îles-de-la-Madeleine groups together the five RCMs of this administrative region as well as the agglomeration of Îles-de-la-Madeleine.